AS IT STANDS: Why Do Republicans Always Misquote Adolf Hitler? Why do Republicans like to misquote Adolf Hitler so often? You'd think if they were going to use historical quotes to make an important point that they'd at least fact check them. #1 Adolf Hitler didn't say that the best way to control a people is to "take a little of their freedom at a time." He didn't even think that. Aside from the fact that this quotation does not reflect something Hitler ever said or wrote, it's also false if simply considered as a shorthand version of what Hitler thought and/or did. These words reflect a misperception that Hitler's political maneuvers on his way to seizing dictatorial control over Germany were akin to the legend of the boiled frog, that Hitler supposedly made a series of small, gradual changes in German law and government that chipped away at the rights of the citizenry over an extended period of time, avoiding any single large changes that might provoke resistance from the people until it was too late for them to effectively oppose him. 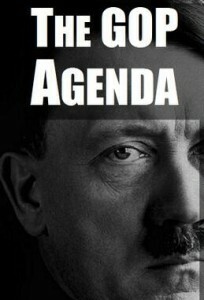 #2 Adolf Hitler never said, "To conquer a nation, you must first disarm its citizens." No one has ever turned up a source documenting that Hitler literally said this (or something very similar). Despite the fact that both of these quotes are patently false they've been circulating for years. The only thing I can think of is no one using these quotes ever bothers to verify them. Like propaganda sound bytes, these Hitler quotes aren't meant to convey reality, but only to further political aims. Same reason why anyone does, it's a misquote. The more important question is why do people dismiss a quote simply because you can't verify who said it. If it correct, its correct, regardless of who said it.